Here are some spectacular photos of the damage (including one that my students pointed out looks like a scene from the movie Titanic). 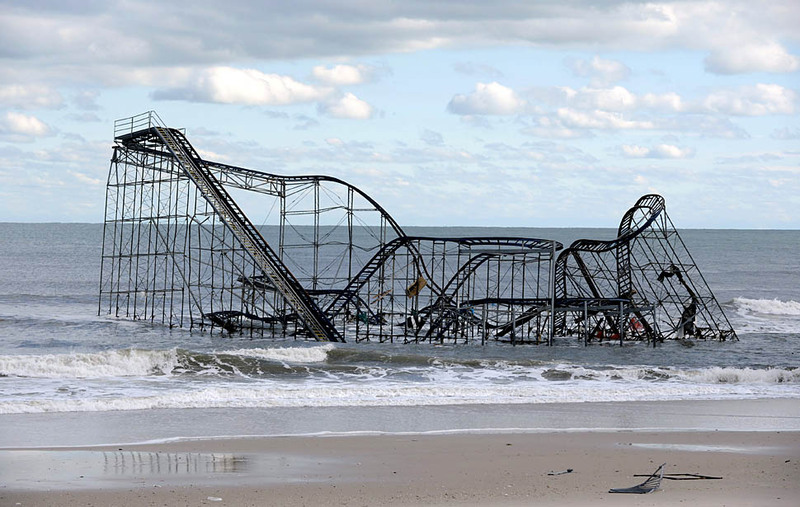 For more on what was unusual about Sandy, see this NCAR article “Four Surprises from Sandy”, and from last weekend, as the storm approach New Jersey, this article in the Atlantic “Why Sandy Has Meteorologists Scared in 4 Images“. 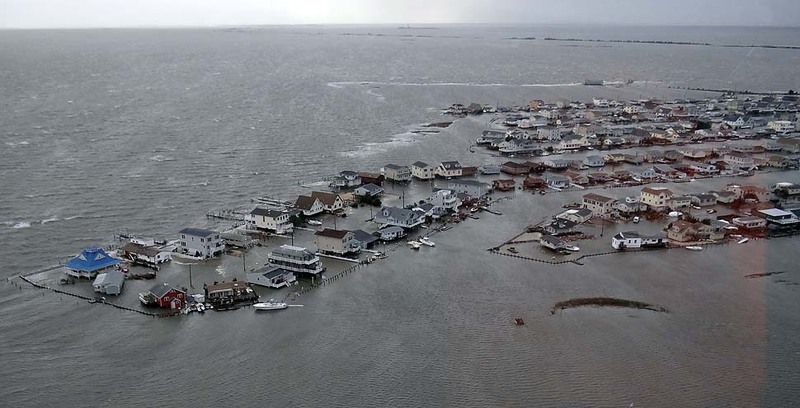 On CNN, Ben Orlove talks about the connection between Sandy and climate change, and, from the AGU blogs, What Those Who Understand Atmospheric Physics Are Talking About After Sandy. When will it make landfall? If it coincides with a high tide, that’s far worse than it it comes ashore during low tide. Where exactly will it come ashore? Infrastructure to the north of the storm takes far more damage than infrastructure to the south, because the winds drive the storm surge in an anti-clockwise direction. For Sandy, New York was north of the landfall. What about astronomical conditions? There was a full moon on Monday, which means extra high tides because of the alignment of the moon, earth and sun. That adds inches to the storm surge. All these factors, combined with the rising sea levels, affected the amount of damage from Sandy. I already wrote about the non-linearity of hurricane damage back in December. After hurricane Sandy, I started thinking about another kind of non-linearity, this time in the impacts of sea level rise. We know that as the ocean warms it expands, and as glaciers around the world melt, the water ends up in the ocean. And sea level sea level rise is usually expressed in measures like: “From 1993 to 2009, the mean rate of SLR amounts to 3.3 ± 0.4 mm/year“. Such measures conjure up images of the sea slowly creeping up the beach, giving us plenty of time to move out of the way. But that’s not how it happens. We’re used to the idea that an earthquake is a sudden release of the pressure that slowly builds up over a long period of time. Maybe that’s a good metaphor for sea level rise too – it is non-linear in the same way. What really matters about sea level rise isn’t its effects on average low and high tides. What matters is its effect on the height of storm surges. For example, the extra foot added to sea level in New York over the last century was enough to make the difference between the storm surge from Hurricane Sandy staying below the sea walls or washing into the subway tunnels. If you keep adding to sea level rise year after year, what you should expect is, sooner or later, a tipping point where a storm that you could survive previously suddenly become disastrous. Of course, it doesn’t help that Sandy was supersized by warmer oceans, fed by the extra moisture in a warmer atmosphere, and pushed in directions that it wouldn’t normally go by unusual weather conditions over Greenland. But still, it was the exact height of the storm surge that made all the difference, when you look at the bulk of the damage. Here’s an excellent article by U of T geology professor Nick Eyles, explaining the geological context for the earthquake last week, how it fits into the history of earthquakes in Japan, how these earthquakes have affected Japanese culture (including an influence on Japanese rejection of Western building styles, and hence to some degree of Western culture in general). I love the way he connects a number of different issues. He ends the piece with some observations about predicting earthquakes in Canada. There’s an interesting parallel with climate prediction here: seismologists can calculate the expected frequency and trends in seismic activity, and hence advise people on what they should do to minimize the risk to people and infrastructure. But they can’t predict the timing or size of any specific earthquake. Likewise, climate scientists can understand the trends and the overall impact of climate change on different regions, but they can’t say exactly when specific consequences will be felt, nor when particular extreme events will happen. In both cases, failure to take the advice seriously will dramatically worsen the impact when a disaster does occur. In my last post, I described our firsthand experience of flooding in Venice, and pondered the likely impact of climate change on Venice in the future. But that wasn’t our only firsthand experience of the impacts of climate change on our travels this summer. Having visited NCAR in July this year, we decided to come back to Boulder for the rest of the fall, to give me a chance to do more followup interviews with the NCAR folks, while I write up the findings from my studies of the software development processes for climate models. Back in August I found a great house for us to rent, up in the mountains at Gold Hill. Shortly after I paid the deposit, I discovered the house was right in the middle of one of the most devastating forest fires in Colorado’s history. The fire, now known as the Fourmile Canyon fire, started on September 6, 2010, burned for over a week, affecting 6,181 acres, and destroying 169 homes. In terms of acreage, it wasn’t the biggest fire ever in Colorado, but in terms of destruction of property and damage costs, it was the worst ever. I first heard about the fire while I was attending the Surface Temperature Record workshop in Exeter in September, and only then because of a conversation at dinner with some of the NCAR folks whose homes were in the evacuation zone. We spent the next few days wondering whether we’d have somewhere to live after all this fall, and trying to trace the path of the fire on various collaborative maps created by those on the scene. Not that we were affected anywhere near as much as the people who were evacuated, many of whom lost their homes and everything in them. But it gave us a taste of the impact of these massive forest fires on the communities who are affected. Amazingly, the house we’re renting survived, even though several of the neighbouring houses burned down. Indeed, it seems amazing just how random the fire was – several patches of ground a few hundred yards from our house have been burned, but almost everything we can see from the house is untouched. The satellite images seemed to show huge areas completely devastated, but in reality, the affected area is now a real patchwork of healthy trees and burned sections. But this patchwork effect is actually easy to understand once you build a good computational model. I particularly like this NCAR simulation of the spread of forest fire. Notice how the prevailing winds (shown by the arrows) push the fire forward, but also how the updraft from the fire affects the wind pattern to the sides and in the path of the fire, effectively funnelling it into a narrower and narrower path. This certainly corresponds to the stripes of fire damage now visible in the area of the Fourmile Canyon fire, and explains why the fire damage seems so patchy. As this fire was unusually large by Colorado standards, I wondered about the impact of climate change. In particular, I thought the damage caused by Mountain Pine Beetles might be to blame. When we drove up to Breckenridge in July, the kids noticed that many of the trees were dead, and we googled a little back then to discover it was because the hotter, drier summers were encouraging the spread of the pine beetles, and weakening the trees’ defences. And from a major study published in September this year, it’s clear that climate change is a major factor, and the destruction to pine forests across the North American Rockies will only get worse as climate change progresses. So I figured all those dead trees would just encourage bigger wildfires. But, as usual with climate change, it’s not that simple. In particular, the areas damaged by fire this year don’t correlate with the areas most damaged by the beetles. It looks like the trees killed by beetles are actually less susceptible to fire, because the needles drop to the forest floor and decompose fairly quickly, while the trees lose the oils that encourage fire in the tree canopy. But although the beetle damage doesn’t cause the fires, climate change affects both, because the hotter drier summers increases both the spread of the beetles and the likelihood of fires. What will sea level rise mean for Venice? I took a break from blogging for the last few weeks to take a vacation with the family in Europe. We fell in love with Venice, a city full of charming alleyways and canals, with no wheeled transport of any kind. Part of the charm is the dilapidated, medieval feel to the place – the buildings are subsiding, their facias are crumbing, and most of the city’s infrastructure doesn’t work very well. In fact, given what a sorry state the whole city is in, I’m surprised how much I fell in love with the place. In Venice, it’s just another Acqua Alta. I’d heard about Venice sinking, given that the buildings sit on wooden rafts, which in turn are supported by wooden pillars driven deep into the soft mud on the lagoon bottom. And of course, I know that sea level rise due to global warming threatens many of the world’s coastal cities. But I didn’t realise just how low Venice really is, and the flooding we saw got me thinking again about whether the future is already here. The last IPCC report forecasts a rise of up to 59cm in sea level rise by the end of this century, due to thermal expansion and melting glaciers. And as we know, the IPCC numbers exclude the contribution of the Greenland and Antarctic ice sheets, which together could be considerably more, and it also fudges the point that sea level rise won’t magically stop in 2100. Which means that Venice, a city that’s around 1500 years old, is very unlikely to survive into the twenty-second century. But like all attempts to pin down the impacts of climate change, it gets complicated. It turns out that Acqua Alta isn’t a recent thing – it has occurred throughout Venice’s history. Technically, Aqua Alta occurs when the high tide is more than 90cm above the average sea level (actually, the average as was measured in the year 1897, according to wikipedia). In the foreign media, floods in Venice are typically portrayed in breathless terms as a disaster (see HuffPost for some dramatic photos from last winter). The locals don’t see it that way at all, and get furious at these media reports as they damage the tourist trade on which Venice depends almost entirely. A you can see, the sea level is expected to vary from low tides around 0cm, and high tides in the range 50-75cm. 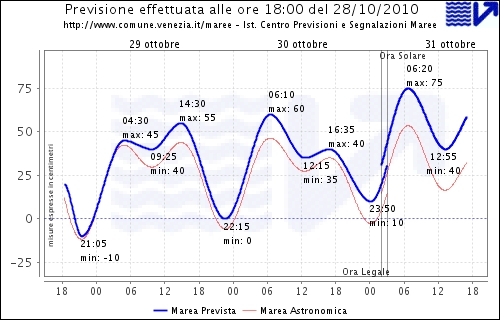 Which is classified as normal high tides for Venice. A high tide of up to 90cm causes almost no flooding, while one of +150cm floods about 2/3 of the city – this happens once every few years. The confusion in the media is that +150cm is about 5 feet; so the papers duly report Venice as being under 5 feet of water. But really the water is rarely more than ankle deep, as the flooding is only the difference between the canal sides and the high water. On the day we took these photos (5th Oct 2010), the high tide reached about 107cm, enough to flood about 14% of the city, but as you can see, the actual flood is only a few centimeters deep. But a sea level rise of +50cm due to climate change shifts things so that every high tide will flood a significant proportion of the city. Flooding twice a day throughout the year is a very different proposition from a little light flooding a few times in the spring and fall. Can Venice be saved? MOSE, a large and controversial flood barrier project, has been under construction for the last few years, and is anticipated to be ready by 2012. It aims to protect Venice with automatic flood barriers around the entrance to the lagoon. The project has been severely criticized both for high cost, for it’s impact on the lagoon ecosystems, and because it doesn’t provide an incremental solution – if sea levels continue to rise, they will overwhelm the barriers, and there’s no obvious way to extend them. The design for the barriers is based on the IPCC projections of up to 60cm sea level rise (although I haven’t been able to find any detailed specifications of exactly what height of tide they will work for). The problem is, if the IPCC reports underestimate sea level rise (and increasingly it looks like they do), then a vast multi-billion dollar project will only buy Venice a few more decades. The techno-optimism of the engineers who designed MOSE seems to be symptomatic a broader mindset when it comes to climate change, which says we can just invent our way out of the problem. It would be nice if it’s correct, but based on the science, I wouldn’t bet on it. Over at Only in it for the Gold, Michael Tobis has been joining the dots about recent climate disruption in Russia and Pakistan, and asking some hard questions. I think it’s probably too early to treat this as a symptom that we’ve entered a new climate regime, but it it does help to clarify a few things. Like the fact that a few degrees average temperature rise isn’t really the thing we should worry about – a change in the global average temperature is just a symptom of the real problem. The real problem is the disruption to existing climates in unpredictable ways at unpredictable times caused by a massive injection of extra energy in the Earth’s systems. Sure, this leads to a measurable rise in the global average temperature, but it’s all that extra energy slopping around, disrupting existing climate regimes that should scare us witless. As I said, the future is already here, it’s just not evenly distributed. Which means that for much of this year, the North American media has been telling the wrong story. They were obsessed with an oil spill in the gulf, and the environmental damage it caused. Only one brave media outlet realised this wasn’t the real story – the real story is the much bigger environmental disaster that occurs when the oil doesn’t spill but makes it safely to port. Trust the Onion to tell it like it is.